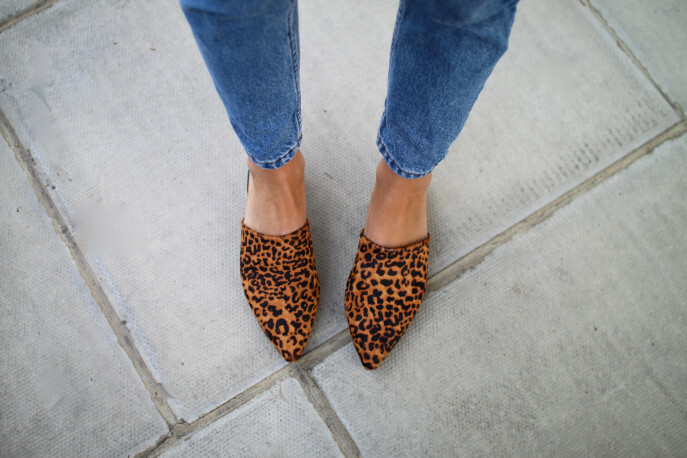 J.Crew’s creative director Jenna Lyons famously deemed leopard print a neutral, and in doing so confirmed what so many of us print phobes knew all the long. I’m pretty much teetotal when it comes to patterns; weddings and swimwear are generally the only times I fall off the wagon and down a rabbit hole of florals, tribal ikats and graphic prints. But leopard always feels easy; a subtle statement that doesn’t feel overbearing or showy. If you’re yet to be convinced, I dare you to try a leopard print coat this winter. I bet you’ll quickly discover that you feel strangely (or not so strangely if we’re going to get back to biology here) camouflaged rather than standing out from the crowd. Forget the out-dated cliches (looking at you Ab Fab, Pat Butcher and Scary Spice) and fall in love with this big cat print asap. Combine said feline neutral with one of my favourite shoe styles (I pretty much slide rather than walk these days) and I’m immediately that person who spends the whole day instagramming admiring their feet.